Lauri Love, the 32-year-old engineering student accused of hacking into multiple US government and private sector computer systems, would face “medieval conditions” if he was extradited to a US prison, the court of appeal heard today. Love, who has Asperger’s, depression and drug-resistant eczema, is fighting an extradition order issued by home secretary Amber Rudd last year. District judge Nina Tempia ruled in Westminster Magistrates’ Court that Love should be extradited, despite finding that there is a high risk he would take his own life. He is accused of working with others to hack the US Federal Reserve, US Army, US Department of Defense, the Missile Defense Agency, Nasa and the FBI Regional Computer Forensics Laboratory, as part of an online protest against the death of internet pioneer Aaron Swartz, who committed suicide, after being charged under the US Computer Fraud and Abuse Act, in what was seen as a politically motivated case. The case is regarded as the key test case for the forum bar, a defence to extradition which was introduced by Theresa May as home secretary to protect vulnerable defendants who could be better tried in the UK, after she withdrew extradition procedings against former hacker Gary Mckinnon. There was a very high risk that Love would commit suicide, either in transit or upon detention in the US, despite the safeguards offered by the US prision authorities, Edward Fitzgerald, representing Love, told the court on 29 November. Extradition “would expose him to a real risk of inhuman treatment given his condition”, and would “take him away from his family and support”. Love’s depression would worsen to a “dangerous point,” he said, speaking on the first day of a one and a half day hearing. Love’s legal team has presented the court new evidence about the “inhumanity of the conditions of the federal prison system” and, in particular, the Metropolitan Detention Centre (MDC), in Brooklyn. The High Court heard evidence from a prisoner who was on suicide watch that a distressed detainee had cut himself and smeared himself and the cell walls with excrement. The excrament was left on the walls of the detention centre for a week, despite repeated requests for cleaning to prevent the detainee picking up an infection. New York lawyer, Joshua Dratel, said a report by the Office of Inspector General (OIG) showed how “inhumane” the conditions in the federal prison system in the US are. He told lord chief justice, Ian Burnett, the lead judge in the case, details of “damning report of the use of special housing” or solitary confinement in these centres. There was just one psychiatrist for 2,461 people at both the Metropolitan Correction Centre (MCC) in Manhattan, and Metropolitan Detention Centre (MDC) in Brooklyn, New York – facilities where Love is likely to be detained if extradited. “One attorney described the care at Metropolitan Detention Centre (MDC) as medieval. Another said that the special needs that Love has would not be catered for,” said Fitzgerald. Another report from the National Association of Women Judges in June 2016 investigated conditions on the women’s floor at the detention centre. The report, presented in evidence, raised concerns over mouldy food given to inmates, the lack of proper medical service, and their lack of access to sunlight and fresh air and exercise. District Judge Nina Tempia who heard the extradition case last year accepted evidence that “no one committed suicide whilst on suicide watch”. But Fitzgerald said three experts who knew the MDC and the MCC well had given evidence to the extradition hearing that the centres could not provide suitable care to meet Love’s needs. The OIG was concerned that inmates can be placed in segregation indefinitely in the detention centres, he said. The evidence is portable, and videos could be provided if the case were to be heard in the UK instead of the US. Witnesses could travel to UK or US to give evidence, Fitzgerald told the court. He presented new evidence in a witness statement from the former director of public prosecutions, Ken MacDonald, showing that similar hacking cases have been dealt with in the UK. The court heard that one of Love’s co-accused, Justin Soyke, was prosecuted in his home country, Australia, for “targeting the US from his Australia-based computer”. In another case, a defendant was tried in the UK, despite evidence from the US claiming he could have started a third world war by hacking into Pentagon systems. “That shows there has been a general practice of trying cases here,” said Fitzgerald. Members of the notorious Lulzsec hacking group, which conducted “the largest cyber attack in history”, were also tried in the UK in 2015, despite facing hacking US hacking charges. It was “highly significant” that the Crown Prosecution Service (CPS) was silent on arguments that the UK is not the most appropriate place for any trial, he said. 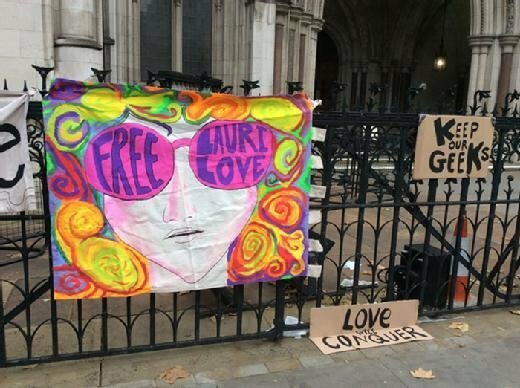 The court heard that Love was arrested and questioned in the UK, so could still be prosecuted in the UK. Love’s links to the UK “should have proved to be the decisive factor”, because of the value attached to citizenship and his severe mental and physical condition and need for support and treatment. “The CPS can take the initiative, can prosecute here, and even if there is harm in the US that can be transferred here. We’re not asking you to take a voyage of discovery to Mars, we’re asking you to do what can be done,” he told the lord chief justice. “As a matter of humanity to protect his fragile health and his life he should be tried [in the UK],” said Fitzgerald. Evidnece from Thomas Kucharski, professor of forensic psychology formerly with the MCC, predicted “a severe deterioration” in Love’s condition, if he were imprisoned in the US. “His ability to make decisions would be severely compromised” and there was a “real risk” that he will be unfit to stand trial. Love has Asperger’s syndrome, suffers from depression and has severe eczema. Fitzgerald said he has had severe episodes of depression since he was 15, “at times verging on psychosis”. Detention centres in the US have dealt with problems highlighted in an inspection report and can deal with Lauri Love’s health issues, the High Court heard later in the day. Peter Caldwell, acting for the CPS for the US government, told the court that “high-profile” detainees were watched 24 hours a day by staff members. The US authorities expected Love to be put on suicide watch immediately, because of his history, and US marshals would “manage” his case and delivery to prison. Prison staff would be absolutely sure there was no ongoing risk of suicide. “We have a very conscientious approach that everything that could be done will be done,” he said. He told the court it should not consider a report by the National Association of Women Judges, which investigated conditions on the women’s floor at the detention centre, that was provided to the court. The US authorities have also addressed problems raised by the Office of Inspectorate General (OIG) report “in a way that would obviate any risks in this cause”, he said, adding there was no risk of risk or oppressiveness and Love’s needs would be met at the detention centre. Caldwell told the court that harm from the alleged cyber attack happened in the US, rather than in Britain, so Love should face trail there. The UK does not have power to hear a case when all the alleged harm happened in the US and not in this country, he said. He rejected the argument that alleged victims could be denied justice because Love is unfit to stand trial. “The view of the district judge was that the appellant is fit to stand trial and understand proceedings, and is able to instruct his lawyers,” said Caldwell. A UK prosecution would have to rely on evidence provided by the US authorities. The prosecutor has to consider the “oversight of the whole investigation” in several states. It could be a timescale of “perhaps years, rather than months” before the case could be heard. Caldwell said consideration of Love’s “connections” to the UK should be limited to nationality, citizenship and the length of time a defendant has lived in the UK, rather than family connections and support, and access to their help in dealing with health problems. There is no definition of UK connections in the legislation which brought in the forum bar, he told the court. Caldwell suggested that the Gary McKinnon case might not have satisfied the interests of justice aspect of the forum bar, which was brought in after his case was dropped. The lord chief justice asked if there had been evidence that Love’s medical conditions would get better after extradition. Caldwell said there was no evidence. “People do get better from psychiatric conditions,” he said. Love is fit to please and stand trial, Caldwell told the court. “He may get better, he may get worse,” he said. Love faces potential trials in three US states, after indictments were filed in the Southern District of New York, New Jersey and the Eastern District of Virginia. He is accused of downloading confidential information belonging to individuals, including credit card details, from US government computers and private companies, causing millions of dollars’ worth of damage, between October 2012 and October 2013. There is no suggested he profited from the information or made it public. According to the US indictments, Love gained unauthorised access to computers by exploiting vulnerabilities in Adobe ColdFusion and by using SQL injection attacks. Once inside, working with fellow hackers, he is alleged to have placed “shells” in the networks, which allowed them to steal confidential data, including telephone numbers, social security numbers, credit card and salary details of employees. The FBI used a “confidential source” to monitor internet chatrooms used by Love and others. Love is alleged to have used pseudonyms including “nsh”, “peace”, “shift”, “root” and “Smedley Butler” to communicate with collaborators on internet relay channels. Fitzgerald said if the case were to be heard in the US, the FBI’s anonymous informant would have to be named, as that is American legal practice. “I believe, because there are articles readily available, that [person] may be Justin Soleyka,” he said. If Love loses, he could take his case to the Supreme Court and, ultimately, the European Court of Human Rights, the court heard. Speaking on the BBC’s This Morning show, on the morning of the appeal, Love’s father, Alexander Love, said the US should trust the UK, its closest ally, to prosecute his son at home. “The Americans apparently have the right to do whatever they like, and they’re attempting to impose a Pax Americana on the whole world. Basically, Lauri would be the only person who has ever been extradited for computer hacking,” he said. He criticised the US practice of offering defendants a plea bargains – which offer a significantly lighter sentence in return for an admission of guilt – as a form of blackmail. “That is not justice. That is threatening. That is exacting some sort of penalty by threatening something awful,” he said. “The DNA of our [UK] justice system is predicated on the idea of an appropriate punishment for a particular crime. The American system is not like that. It believes in a punitive justice. It believes in exacting a kind of revenge on certain people,” said Love’s father. Journalist Barrett Brown was released from federal prison last year, having served a four-year sentence after he copied a link to hacked client and credit card details from the security company Stratfor from one internet chat site to another. He told the BBC that many British people assume that the US justice system is as civilised as the British system, when in reality it is broken. “When I say that, I’m speaking obviously from experience, but I’m also simply repeating what all educated observers have said, including economists, congressmen on both the left and the right, newspapers – everyone agrees that the prison system is devoid of due process,” he said. Brown said he was denied his medication, denied documentation, and held in a segregated housing unit in retaliation for conducting interviews and writing a column from prison. His prosecution was widely seen as a case of prosecutorial over-reach. “Lauri, like everyone else and like me, will be subject to a lack of due process. So whatever particular difficulties arise – and there’s any number of difficulties that can arise for anyone, much less for someone who has physical or mental health problems – he will find that he is not able to challenge those conditions in the courts,” he said. “There is any number of things that can go wrong for any inmate, particularly somebody who is seen as a whistleblower, seen as an activist, seen as someone who goes after the secrets of governments and challenges them – those people suffer particular retaliation,” he said. Kevin Kendridge, solicitor advocate and head of the extradition department at Kaim Todner Solicitors, which is representing Love, said that Love’s case was exceptional. In every other case in recent time, with the exception of Gary McKinnon, whose extradition was blocked by Theresa May on humanitarian grounds, the Crown Prosecution Service (CPS) has chosen to prosecute cases involving cross-border hacking in England. “All of the alleged criminality took place here in England. The CPS routinely prosecutes such conduct where the effects of the cyber crime are felt in the US. It would be inconsistent with CPS policy to send this individual, who is acutely vulnerable, away from the essential support of his parents,” said Kendridge. Speaking before the hearing, the human rights group Liberty, which is giving evidence in the case, said the UK was miss-applying extradition rules. Emma Norton, head of casework at Liberty, said: “If someone is accused of having committed a crime here in the UK, this is where they should stand trial. Extradition powers exist to stop fugitives escaping justice – not pack vulnerable Britons off to foreign courts and unfamiliar legal systems. The National Autistic Society said the criminal justice system could often overlook the needs of people with autism. “Autistic people may struggle to understand or communicate with others or cope with new environments. If they don’t receive support in prison, they risk developing complex and long-term mental health problems, and often cannot benefit from programmes to prepare them for release if those programmes are not adapted for their needs. This article was corrected on 30th November. The original story mis-reported the charges against Barrett Brown. In fact prosecutors dropped charges against Brown for identity theft and credit card fraud. Read more about Barrett Brown’s case here. If you have been affected by any of the issues in this story, contact Samaritans free 24 hours a day on 116 123. You do not have to be suicidal to call.